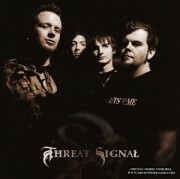 Threat Signal has recently changed their line up after former members, Norman Killeen and Adam Weber, agreed to part ways. The former members have been replaced by new talents Alex Rudinger and Chris Feener, on drums and guitar, respectively. “I caught wind of Alex’s drumming through youtube.com. He has a large number of drumming videos including covers, and originals. My jaw dropped when I first saw this kid play!” Threat Signal said about Alex. Alex is from Frederick MD, USA. Threat Signal deliver forceful new single "Exit The Matrix"